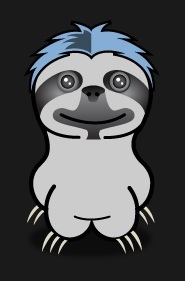 Meet "Cyril The Sloth" - Syncbay's Mascot! When you make Syncbay.com your home page, Cyril will begin brightening up your week by delivering hilarious videos from within his infamous 'Odd Box' where you will also be able to access a range of reports, advice, comparisons and opinions on popular topics such as business, health, music and sport. ...But What The Blazes Is A 'Sloth'? A sloth is an 'arboreal mammal' indigenous to the South American Rainforests. The name has come to suggest laziness or slowness because of their easy-going lifestyle. Cyril is VERY easy going... probably the easiest-going of ALL the sloths. What do they do? Well, the sloth is very slow and deliberate in its movements and lives 'upside down' in rainforest trees for most of its life. Their digestive systems are also very slow and the standard feast of an extra large plate of leaves may take as much as a month to completely digest! How big? 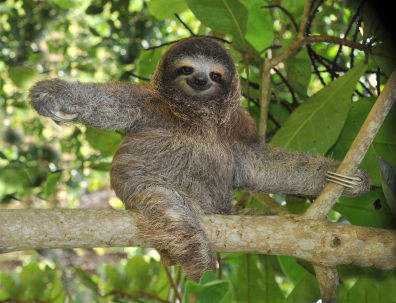 Sloths are relatively small in size. Most are about two feet long and weigh approximately nine pounds (roughly four kg). Cyril is 2.2 feet long and weighs 12 pounds - the fatty! Their Appearance? They have small eyes and ears, and some varieties have tails (Cyril doesn't, best not to mention it though). Their brown or grey coats are fuller toward the head and upper body, and they have an undercoat of dense fur. Average life expectancy in the wild ranges between 10 and 40 years. Cyril is 14 years old. Look Up To See "Cyril At Home"
So... join us (and Cyril), make Syncbay.com your home page and install our toolbar today - It'll only takes a few seconds. Syncbay is something you'll use every day, every time you go online. It will save you opening and closing Google or other search providers repeatedly... it'll eliminate having to perform unnecessary searches, checking favorites, remembering and typing in domain names and URL's every time you want to view a website... the list goes on. Essentially, it'll make your life much easier as everything you want and need will be in one place... and your home page will be completely ad free. No annoying pop-ups, pop-unders or anything like that. We promise!